Afour-man team from the 82nd Airborne Division, Fort Bragg, N.C., captured the Best Mortar Team Trophy during the inaugural Best Mortar Competition held at Fort Benning, Ga. The winning four-man team included Staff Sgt. James Pennington, Sgt. Ryan Mosser, Cpl. Jacob Nolan and Cpl. Alec Norton. Earning the Best Individual Trophy was Sgt. 1st Class Yuslandy Figueredo, of the 198th Infantry Training Brigade. 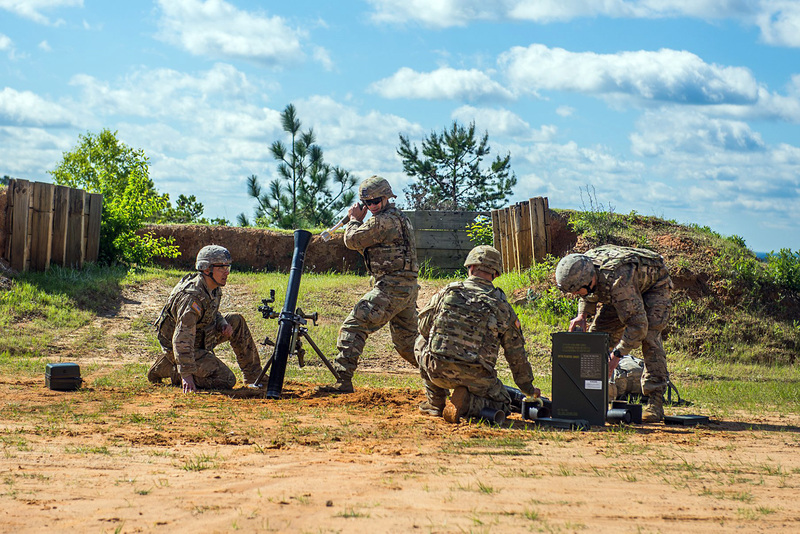 Pennington said the soldiers on his team all love their jobs and realize the vital role mortars play in an infantry formation – that might have contributed to their success in the first-ever Best Mortar Competition. “We’re getting paid to shoot rockets out of cannons. How cool is that,” Pennington said. He said each soldier understood each other’s strengths and weaknesses and worked to help each other overcome obstacles. Mosser concurred with that assessment, and said that members of his team and the rest of his squad back at Fort Bragg are so close, they hang out with each other even after work. “I’d trust my life with any of them,” Mosser said. Mosser also said the stressors and challenges his team faced during the competition exceeded anything they do back at Fort Bragg during home-station, live-fire training. The stress, he said, came from the piling on of a lot of strength and endurance events prior to the live fires. Norton said that even though his team won the competition, nobody was perfect in his performance. Every competing soldier slipped up occasionally, he said, and whenever that happened, his teammates were there to lift that soldier up. Nolan said his team’s success at Fort Benning also drew from their persistence and a willingness to win. “Soldiers in the 82nd don’t believe in quitting,” he said, adding that he was still very impressed by the skills and effort put out by soldiers from all of the teams, particularly the Rangers, who took second place in the competition, and were nipping at their heels the entire time. All four members of the winning team said they would bring what they learned back to their unit and try to introduce more physical events into their mortar training plans. The third place winner was the team from the 101st Airborne Division. Figueredo, the individual winner, said the most thrilling part of the event, besides team camaraderie, was scoring a direct hit on a tank with his first 60mm mortar round despite a strong crosswind, and watching the sparks fly from impact. The lethality of the mortars is why their motto is “High Angle Hell,” he added. Staff Sgt. Dustin Wimberley, an evaluator on the mortar live-fire range, said blowing things up is the best job in the infantry. Wimberley captured first place in the individual category during a pilot mortar competition held in June. Lt. Col. Samuel Edwards, commander of 1st Battalion, 19th Infantry, the unit hosting the competition, said he was impressed by the fortitude and tactical excellence of all of the competitors. “One of the competitors was a private first class who graduated from basic training just two years ago,” Edwards said. Brig. Gen. Christopher Donahue, commandant of the Infantry School, spoke at the awards ceremony. He said teams of mortarmen are now in Afghanistan and Syria supporting the mission. The enemy is watching what those soldiers are doing, he said, and are “going to school” on ways to defeat them. Donahue encouraged soldiers to return to their units and invest the same rigor and standards to home-station training that they experienced during the competition. This year, seven four-man teams from around the Army competed in the Best Mortar Competition. Teams came from the 82nd Airborne Division, the 75th Ranger Regiment, the 10th Mountain Division, the 7th Infantry Division, the 1st Infantry Division, the 101st Airborne Division, and the 198th Infantry Training Brigade. The competition evaluated the implementation of techniques and skills in accordance with the Army Mortar Doctrine training guidance, said Capt. Luis Rivas, lead planner for the event. Indirect fire infantrymen provide critical capabilities to Army ground forces and as such, their proficiency contributes immeasurably to Army readiness, Rivas said.